The Father of Earth shows a rancher standing at the top of a long stone staircase looking out over all he owns. There are snow covered mountains, trees, and horse barns. Horses are making their way to the pasture. His hands are on his hips. He wears green and blue with cowboy boots and spurs. The Father of Earth has built his domain through his own hard work and sacrifice. His pose suggests he is well satisfied with what he sees. He takes what the Earth has to offer but gives back equally so there is never a shortage of resources. Like the mountains, what he has built will endure for generations. 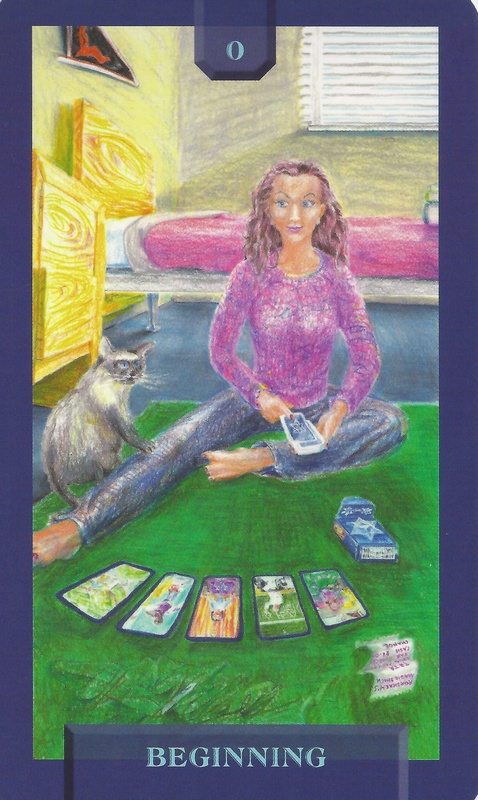 This card shows how we cultivate abundance in our lives. Respect the source, the Earth, and never take more than needed or take by unscrupulous means. Then replace what was taken by giving back in equal share. This ensures stability, endurance, and continued growth. The staircase represents his climb to the top. Snow represents the purity of his intent. He wears green to signify his connection to the Earth and prosperity. Blue suggests he finds peace in what he does. Spurs represent the motivation to prosper. 5-25-18 Today’s Tarot is the Eight of Air. The limitations you are experiencing are your own creation. Change your thoughts and you will free yourself. This will take time and hard work but it will be worth it. This card is about self-imprisonment and fear. The Six of Air shows a family packed in their vehicle and heading down the road. Today’s Journey is the life we lead every day. Over and over again we pack up and move on. Sometimes the move is a monumental and life changing leap of faith and sometimes it is as simple as throwing out an old pair of shoes. Whatever is not working can be left behind and we can start over. It is not as easy as it sounds, but the opportunity always exists even if we cannot see it or are afraid of it. The geese leading the way suggest it is always better to follow our instincts. We know when it is time to make a move and it is a waste of energy to postpone or worry about it. The grass and trees express the new growth that comes with change. The clear sky ahead assures they are moving in the right direction. The paper airplane the child holds symbolizes the playfulness of freedom. Renewal is indicated by the license plate. The car is positive thought manifested. 12-10-16 Today’s Tarot is Key 8 Fortitude. You have been building a character your whole life. It will serve you well when you need it. Never doubt it. This card is about inner strength and spiritual awareness. The Child of Water shows a young boy standing in tall grass reaching up with his hand to catch a raindrop. There is a purple guitar case slung over his back displaying the yin/yang symbol, a dolphin and a rose. He wears blue. He reaches out to the raindrop to capture his budding emotional nature. This child has an awakening desire to make music. The yin/yang symbol is the balance this expression will bring into his life. Dolphins are sensitive and gentle creatures and a rose symbolizes the subconscious mind. The purple case is the promise of mastery. Without the sensitive souls willing to share their imaginations with the world it would be a bleak and stark place to live. 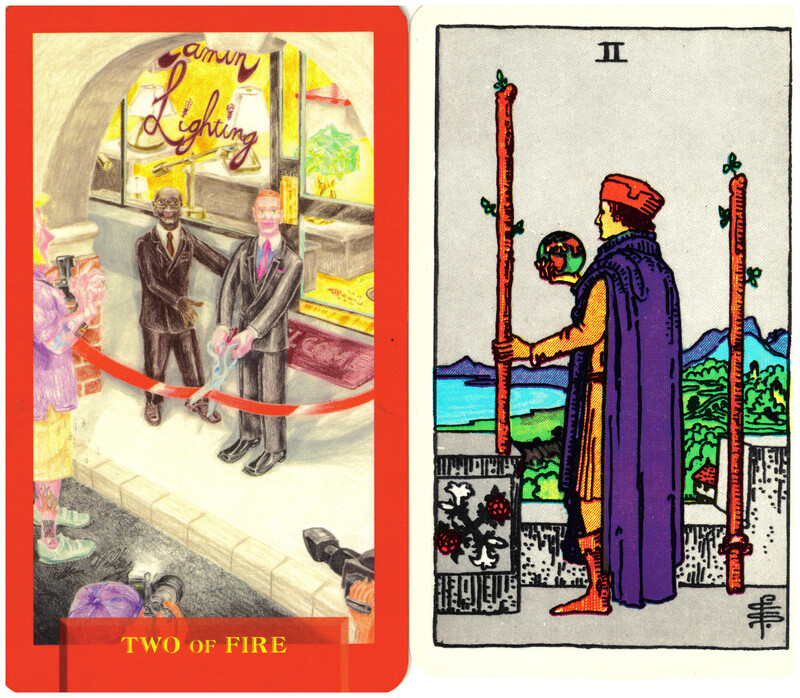 The Two of Wands from the Rider/Waite/Smith deck shows a richly dressed man holding a globe as he looks out to sea. It is a card of attainment of goals, achievement and success. The symbolism here is difficult to discern unless you are familiar with the meanings of the colors, the globe, the crisscrossed roses and lilies, etc. To modernize this concept in the Two of Fire, Expanding Dimensions, the authors of Today’s Journey Tarot chose to depict a ribbon cutting ceremony for a new lighting business. The lighting emphasizes the fire element of the card – the energy behind the success. Since this is the beginning of the business, the possibilities for future success are just beginning. 7-2-14 Today’s Tarot is Key 0 Beginning. This is a good day to start anything new. If you’ve been putting it off or waiting for the right time, this is it! This card is about new journeys and discoveries.